The term "antisemitische" was coined in Germany in 1879 by the anti-Jewish author Wilhelm Marr (1819-1904). A seemingly minor point crops up from time to time but grows in importance the more you reflect upon it. Should one write 'anti-Semitism' with a hyphen or 'antisemitism' as one word? What is the importance of such a technical question and why should anyone, apart from type-setters and proof-readers, worry about it? 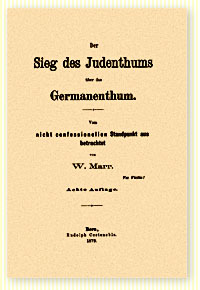 The Victory of Judaism Over Germanism, Wilhelm Marr. 1879. Let me start at the beginning: When did the word 'antisemitism' make its first appearance? It is generally attributed to Wilhelm Marr, who was called by the Israeli historian Moshe Zimmermann "The Patriarch of Antisemitism." Marr coined the term in the 1870s to distinguish between old-time Jew-hatred and modern, political, ethnic, or racial opposition to the Jews. This term made great advances and soon became common usage in many languages. So much so, that it applied not just to the modern brand of Jew-hatred butagainst all logicwas attached to all kinds of enmity toward Jews, past and present. Thus we now say 'antisemitism', even when we talk about remote periods in the past, when one had no inkling of this modern usage. Purists no longer cry out in dismay against such anachronistic practice; it is currently established procedure to use 'antisemitism' for all types of Jew-hatred. Lets go back to the hyphen then. Whats the difference? If you use the hyphenated form, you consider the words semitism', semite', semitic' as meaningful. They supposedly convey an image of a real substance, of a real group of peoplethe Semites, who are said to be a race. This is a misnomer: firstly, because semitic' or 'aryan' were originally language groups, not people; but mainly because in antisemitic parlance, semites' really stands for Jews, just that. And mind you, Jews are not a race at all. They do not all have inherent characteristics in common that may distinguish them from other people. What unites them is a tradition, culture, history , destiny maybe, but not genetics. If you do assume for a moment that Semites are a special race, consider also the implication that this so-called race comprises both Jews and Arabs. One often talks of the kinship between these two, who are now at loggerheads with each other. Be that as it may, antisemites talking against semites' do not generally refer to Arabs; they mean Jews. So did the Nazis who killed the Jews and invited coöperation from the Arabs. It is obvious then that 'anti-Semitism' is a non-term, because it is not directed against so-called semitism'. If there is any substance to the term, it is only to denote a specifically anti-Jewish movement. Antisemitism is a generic term which signifies a singular attitude to a particular group of people. As the late philosopher Zvi Diesendruck pointed out, "There has never been coined a standing term for the merely negative attitude" to any other people in history. Only antisemitism; only against Jews. So the hyphen, or rather its omission, conveys a message; if you hyphenate your 'anti-Semitism', you attach some credence to the very foundation on which the whole thing rests. Strike out the hyphen and you will treat antisemitism for what it really isa generic name for modern Jew-hatred which now embraces this phenomenon as a whole, past, present andI am afraidfuture as well. Also see: Der Weg zum Siege des Germanenthums über das Judenthum (The way to victory of the Germans over the Jews), Ein Mahnwort an die Wähler nichtjüdischen Stammes aller Confessionen. Mit einem Schlusswort: "An die Juden in Preussen". Berlin : Dritte Aufl, 1879 (48 p ; 8vo) ; Antisemitische Hefte. no. 1-3. / [by] Marr, Wilhelm . 1880. Politik und Wucher der Juden. Zu den Schriften W. Marrs. / [by] Helmdoerffer, F. X. ; Marr, Wilhelm . 1879. Der Sieg des Judenthums über das Germanenthum. Eine Widerlegung der W. Marrschen Polemik [contained in a pamphlet with the same title] in historischer und allgemeiner Beziehung ... 2. Auflage. / [by] Linden, Gustav von, of Leipsic ; Marr, Wilhelm . 1879. Es muss alles Soldat werden! oder die Zukunft des Norddeutschen Bundes. Ein Phantasie-gemälde. Hamburg, 1867. 8o.. Der arme Jude, wie ihn der grosse Demokrat Herr W. Marr besp. ... (richt). Beleuchtet von keinem Juden. Hamburg und Leipzig, 1862. pp. 15. ; 8o.. Der Ausschluss Oesterreichs aus Deutschland ist eine politische Widersinnigkeit, etc.. Hamburg und Leipzig, 1866. and others.